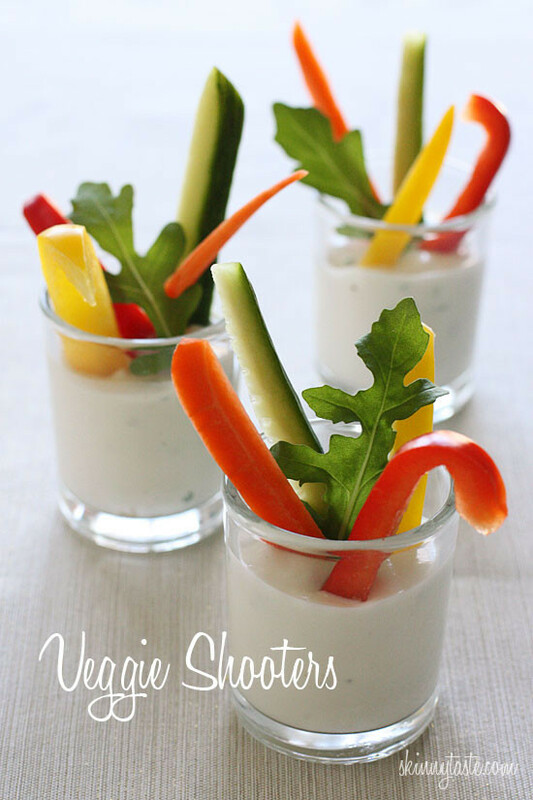 These veggie shooters with fresh cut vegetables served in individual shot glasses and your favorite dressing makes for an easy, healthy, elegant appetizer. No double dipping! I love this colorful appetizer because it’s quick and requires no cooking, a few other no cook healthy app ideas are Smoked Salmon Pinwheels, Tuna Deviled Eggs, and Zucchini Carpaccio. 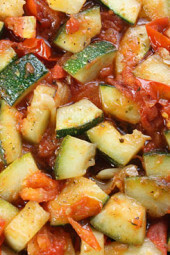 Think color and use your favorite vegetables; raw zucchini or celery would also be great. These are also kid friendly, my daughter loves bell peppers, carrots and cucumbers. Of course, you can buy store bought dressing to save time, but whipping up a batch of your own is easy. 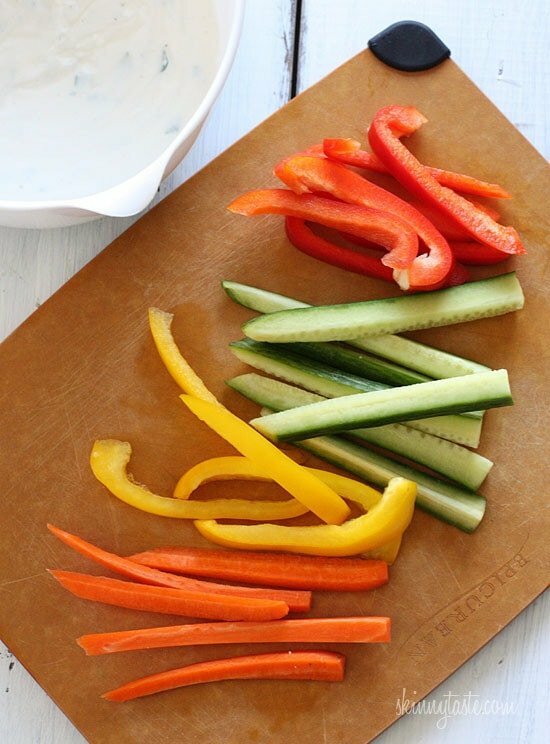 You can make the dip and cut the vegetables ahead of time, then assemble when you are ready to serve it. If you are serving vegans or dairy free diets, swap the ranch dip for hummus! If you’re heading to a Holiday party and are worried about over-eating, bring these veggie shooters and skip the chips! In a small bowl combine the sour cream, yogurt, mayonnaise, garlic, powder, onion powder, parsley, chives, salt, and cracked pepper. Stir in the white balsamic vinegar; then buttermilk. Adjust the seasonings to taste, adjusting the vinegar as needed, the flavors will become bolder over time. Place 1/4 cup of dip in each glass. Place the strips of vegetables in each glass and serve cold. How long do you think I can save this in the fridge for ? I have proper "shooter glasses,Would it be okay to use those instead of "shot glasses?Know are not as wide. I'm going to make this for my daughter's 1st birthday party next month. I've found plastic shot glasses at PartyCity.com and will use those to hold it. Should be fun!! Thanks for the inspiration! We do a recipe close to your veggie shooters but substitute the chives and yellow bell pepper but the taste remains the same – crispy. Such a cute idea. Love this for entertaining. Very cool idea! I will try this for a party someday. Thank you, Gina. I had planned to have some cheese, crackers, salami, etc. for the family to snack on Christmas Day (after brunch and gift opening) and wanted to do some veggies but couldn't think of a way to make them easy and appealing enough that everyone would actually eat some of them. I've got those same little glasses from B,B&B, so I'll make these up and everyone can put one on their plate next to the less-than-skinny options. The prospect of lessening the chance of spreading the traditional Christmas colds of some family members is the cherry on top! Yes, good point!! You can use any dip or dressing you like. On Christmas Day, after opening gifts, I brought out these little glasses with ranch dressing and bright veggies. I placed the glasses on small plates, with more veggies on each plate for additional dipping. They were such a hit, every single person (including the 3-year-old) cleaned up every shred of all those crunchy, colorful vitamins. Thank you for such a great idea. These are perfect! They would be great for a potluck. Thanks for sharing! 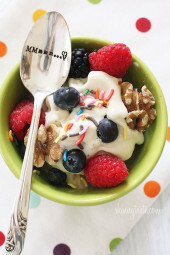 i made some of these for my holidays party– perfect portions! 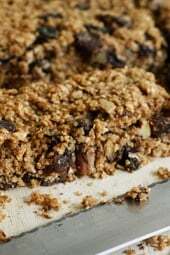 Great recipe and a wonderful way of portion control!!! Oh yes, this is what I'm craving after an overload of sweets…veggies, veggies, veggies. What a fun way to present veggies to kids (and adults). I am so with you there! It's not even Christmas, and I am completely burned out on sweets. just a fancy word for cut raw veggies. What is a Crudite? Never heard the term before. How is that word pronounced? Thanks! My daughter is having her Junior girl scout friends over on Friday for a little Christmas party. I'll whip this up for them — along with cookies and holiday treats of course. Nice to have a healthy option for them. I'll see how it goes and let you know! I've always made ranch from the package, although tried to make it with Low Fat Hellmann's and Greek yogurt, so now I'm glad to have a homemade version. Very beautiful and I'm guessing very delicious. Thanks. oh i've done these for dinner parties – BIG hit! I got them at Bed Bath and Beyond, but I would check a dollar store or just buy a set of shot glasses. Makes a great hostess gift too. ah, I LOVE this. I may do this for a holiday party I have coming up, where did you get the glasses?? ?